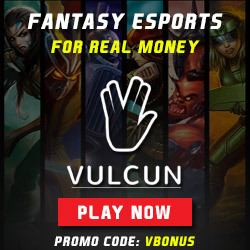 Daily Fantasy eSports (DFES) has taken off and when you visit Vulcun.com you’ll find pics of Vulcun winners holding up signs of how much they’ve won playing at the site. So the question is then, what is the best strategy to win money on Vulcun? This is a multi-part answer but for today we are going to focus strictly on contest types. Below we break down the esports contest formats available to play at Vulcun and show you tips for each. *For New Players – Use Vulcun Promo Code VBONUS when you join and receive $5000 worth of gold currency + 15 extra loot crate boxes. This is a certified 2015 Vulcun deposit bonus give strictly for our users. Tournaments – These are larger prize contests with the number of entries usually in the hundreds or thousands of players. Typically have a lower or mid-range entry fee with a huge cash payout to the top 3 winners. About 20% of entries will win a cash prize. You need to take more chances with your fantasy picks in these games as you want to separate yourself from the rest of the pack who will all have similar picks. Look for players who are due for a breakout game or who is coming off a bad previous game. The large field may tend to ignore them in that case and you can end up with a nice sleeper pick. Winner Take All – Pretty self-explanatory; enter the contest, beat everyone and win the prize. Odds of winning depends on the number of entries. If it’s a small field say 15 or less you will want to take smart picks, look for consistent point getters. Once again you want to take a couple chances with one or two of your picks because it’s WTA so you need to go for broke and hope a sleeper pays off big along with your other “safer” picks. Head to Head – Play against 1 other person, if you score more points than your opponent, you win the prize. Therefore you have a 50% chance of winning. These ones are tough if you are a new player so be careful. Most skilled or “shark” players tend to play in H to H contests to beat beginners. I advise you do a lot of research before entering these contests, don’t just wing it. Look to draft top esports players playing in a favorable matchup. 50/50 – Also known as double ups, you enter versus a pool of players (10, 20, 100 etc.) and the top half of players that score the most points double their entry fee (minus the rake). So 50% of the players win cash at the end of the contest. This is our recommended contest format for new players as we explain below. Which Vulcun Contest Type Is Best For Winning Money? Yes, we all dream of cashing in huge with a big tournament win. Wouldn’t it be great posting that huge novelty check pic on Facebook grinning ear to ear? Sadly though the reality is that you only have a 20% chance of winning any money in that tourney and the odds of you winning the top prize is even less. It can be done but it’s damn hard and you usually have to put in a lot of hours developing your skills before that big check makes it way into your pocket. Your best bet (especially for new players) is to play the odds and stick with 50-50 games. We would recommend 50/50 games over Head to Head but either one has odds of 50% that you will win money. Remember though, 50/50 contests can be filled by very skilled esports players so I’d stick to lower entry fees when starting out. Double ups or 50/50 is truly where you can make some great money. It can be a bit of a grind but when you only have to beat 50% of the field, you can use your skills to keep building a bankroll week after week. There’s nothing wrong with putting in a few entries occasionally into a Tournament or Winner Take All Contest but consider your chances of cashing in on a consistent basis in these contests very low. We usually play tournaments for the sheer fun of it all, it’s extremely exciting to see yourself move up the leaderboard when there is hundreds of thousands in prize money on the line. But remember new Vulcun players if you truly want to make solid money playing at Vulcun and develop fantasy esports skills then play in 50/50 games. After awhile you will win enough money in them so that you can take your shot at the bigger tournaments.